Recent weeks we had the facebook newsfeeds abuzz about the suspension of Uber and Grab vehicles with no franchises plying the road. The Land Transportation Franchise Regulatory Board (LTFRB) deemed these vehicles as unsafe. Here's my take on said issue. Before it all happened good thing I had the pleasure (?) of taking a cab myself so I had to re-live again the cab days, the golden (?) years of the taxi. Now having been in a taxi since time can't tell, all the memories came back to me. Arrogant driver, not well kept vehicle, weird smell and the contracting done, they all came back as if it was yesterday. When my phone had a difficult time of getting a stable internet signal, I was not able to access my Grab App. I was in Magallanes, hoping to hail a grab car to my destination in Newport City. A very short distance but was inaccessible by jeep or bus from Magallanes. Then due to necessity, heavy breathing, and with a deep breath I hailed a cab. Immediately the driver asked for Php200. Then somehow he saw my Media/ Press ID and he may have thought I would report him, he immediately said, get in. I asked I didn't said yes to the Php200, then he said meter is good. Wow what a piece of plastic could be so powerful I reckon. Then while inside, I was aghast by the number of signs/ announcements in side the vehicle. 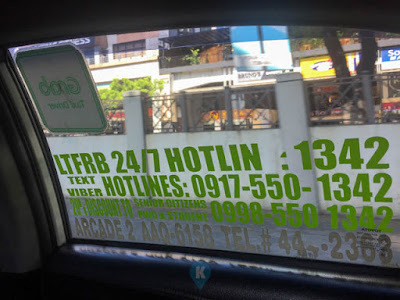 On my right had the LTFRB hotline which I hadn't tried yet. But based on what I read, these numbers either just keeps on ringing, doesn't work, and when you get someone on the phone, they weren't much help either. So good luck in filing a case against the driver should you pursue one. Then theres a sign about not smoking inside the vehicle. Funny. The inside of the taxi smelled like someone is smoking or has smoked inside the vehicle. Mix the smell of wet carpet gone wild thats what the inside of this taxi smelled like. Every time we hit a pot hole, the whole car shakes. OMG. This vehicle is relatively still maybe 2 years old yet it feels starting to fall apart. The seat I was in wasn't comfortable as if the springs somehow was already sprung (?). This taxi driver was cheerful I might add at the start of the journey. Maybe because I was a media person. But somehow along the way, his real persona came to light. His tales of woe started. He said that traffic is worsening and that gas prices went up and has a lot of problems that he said earning a living is very.... very..... hard. This made my short trip to my destination miserable. He was miserable and misery loves company, so I was also miserable. The driver deliberately almost missed a turn have I not called his attention. He was intentionally running the meter so that it would show a higher fare. I know that he knows a short cut to my destination but he purposely tried to explain to me how his "route" will save me more time. My route had traffic he said, but I insisted to follow my directions. He was a bit arrogant and hesistant but he finally gave in and we both found out it wasn't traffic. He praised God that it had a clear road ahead. He didn't have change. My fare amounted to Php80 pesos so when I gave a hundred, he was looking for loose change in all the nooks and cranny of his taxi. So much delay that we were blocking the entrance of the hotel already. He apologized nicely but I was keen on really getting that change. I am really annoyed by this tactic so I really waited. I could have given him the Php20 after hearing him how life is hard etc. He made me miserable as well and made me realize that earning a living is hard so that Php20 was also important to me. When he noticed that I didn't flinch and waited for him to do something, he fished out his wallet and a miracle happened. He had bundles of Php20 in his wallet that he forgot he had. What a ...... oh well, got my change and alighted his taxi. Now after going through the process, let me narrate how a typical Grab Car experience would be. Grab Car Observation 1 - As the fare is already shown in the app, that is your contracted price. The driver will not ask for additional fare from you. Should he do so, he can be reported to Grab. Grab Car Observation 2 - the inside of the car is clean and no signages can be seen. Clear of clutter as it really looks like your own car (unless you have hello kitty plushies lying around your own car). Grab Car Observation 3 - No weird smell. Most of the Grab Cars I get is already 5 months old yet they smelled as if they just came off the factory. Great smelling cars. Grab Car Observation 4 - No shakes on pot holes. Car feels solid, inside of vehicle is quiet and you have peace and quiet. You rarely can hear outside noises. Grab Car Observation 5 - The driver doesn't tell how miserable his life has been. Usually they do have those moments, but they are all cheerful and that turning their vehicle into a Grab Car is giving them hope. 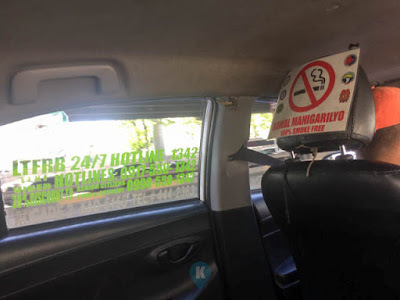 Although some do say that operating a Grab Car is not profitable, yet they still do it and somehow their voice hides the sadness of it all. In the end, most of them are cheerful. Grab Car Observation 6 - As the fare is already set, the driver really finds a way to take you to your destination fast and safe. They all use waze (the navigational app). Grab Car Observation 7 - They all have change. Even if I tell them to keep the change, they immediately have the change in hand. ready to give them to me that it feels like I'm being rude not accepting the change. In summary, riding a taxi is not a good experience. Grab Car is a bit costly but the fare difference is not that big. I consider the difference as my payment for my peace and quiet and safety. I really don't know how LTFRB define the word "safety". I really do hope that those who made that action in that department is a public vehicle riding public servant and not the driving your own car or chauffeured one. Both the taxi and the Grab/Uber cars have insurance so passengers are covered. 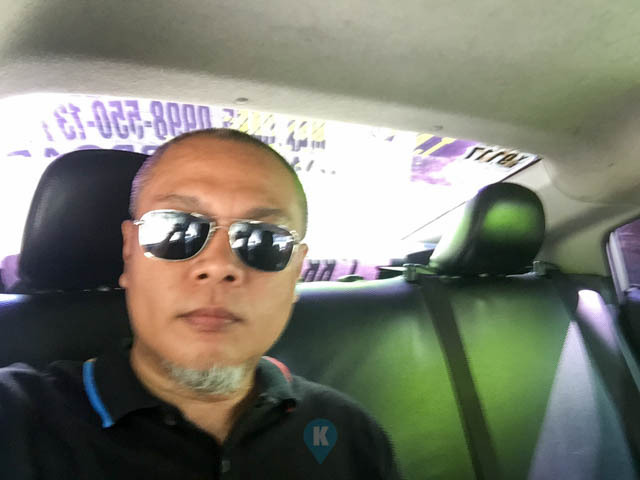 When security is considered, I feel more safe with the Grab or Uber Cars, as I can report them to their companies and they can do something about the drivers concerned whereas I don't know if LTFRB can handle taxi driver complaints well. LTFRB says most vehicles from Grab or Uber have no franchises yet. So its their fault they haven't issued them fast enough. In the end we the riding public has to suffer with their ineptness. They should work hard and fast enough to issue them. When you are encountering delays in government service, that only means one thing. Red tape breeds corruption. I hope that my thinking is wrong since we are in the Duterte administration. I do hope they really have the riding public in mind when they do their jobs. We will update you in the coming weeks when the issue has been resolved. * in another facebook status I read. Grab and Uber franchises does not fall under LTFRB rules. Let me look into this and will make a separate article on this if my research holds this axiom true.